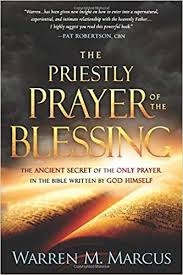 The Priestly Prayer of the Blessing | Karmal Books online Christian books and media store. The ancient secret of the only prayer in the Bible written by God himself"--Cover. Did you know that God wrote a prayer for you? It was discovered on a silver amulet found in a tomb opposite the Temple Mount in Jerusalem, written in the ancient Paleo-Hebrew language. Moses was told by God to have Aaron, the high priest, pray it over the children of Israel every day. For forty years, as the children of Israel wandered in the wilderness, they received supernatural provision, divine health, angelic protection. Marcus reveals the ancient secret on how to pronounce a new amplified Hebrew-to-English translation so you can experience a supernatural, intimate, and experiential relationship with your heavenly Father in a way never thought possible. Warren Marcus is a Messianic Jewish believer and an avid student of the Bible, specializing in the Jewish roots of Christianity. He is ordained as a Spirit-filled evangelist in the Southern Baptist denomination. He serves as vice president of Sid Roth's Messianic Vision Inc., where he oversees the production of the weekly It's Supernatural! TV show. Marcus has also produced The Great North American Revival DVD series and the award-winning animated children's series SuperBook and Flying House. He also produced the highest-rated religious TV special of all time, Don't Ask Me, Ask God, featuring Michael J. Fox, Ned Beatty, and others. Warren Marcus has written a fascinating study on the Priestly Blessing that helps Christians understand the significance of the Father's blessing. As a Jewish Christian, Warren takes us back to the Jewish roots of the Christian faith. He focuses on the fullness of the Godhead (Elohim) to help us understand the magnitude of God's person and the significance of His blessings in our lives. Don't miss this incredible book! The Priestly Prayer of the Blessing is a fascinating reading experience. The non-Jewish reader will be immersed into the world of Jewish cultures and traditions. The Jewish events are included in explanations of Jewish phrases, which will expand the understanding of the reader. But also the Hebrew spelling of the names of the Father, the Son, and the Holy Spirit will grab the attention of readers because the unusual focus and attention on the object of the words, God Himself. Warren Marcus is my friend. We have prayed together and served the Lord together at Thomas Road Baptist Church and Liberty University. May the testimony of his conversion experience capture your heart. Perhaps you might share this book with Jewish friends that could lead to their conversion to Jesus as Messiah and Lord. As I read this book, I became overwhelmed by the rich revelation relating to the Hebrew meaning of the words in this priestly blessing. The blessing in Numbers 6 has been very significant in my life but reading this powerful book has given me fresh revelation of the Father's extravagant love and care for us. After I finished reading this book I was compelled to kneel, pray, worship, and take time to apply what I had read and received, thanking God for His blessing and kindness. I pray that this book will take you into deeper fellowship with the Father and provoke you to worship, just as it has done for me. Warren Marcus, as a five-year-old Jewish boy, had an extraordinary dream about visiting heaven and seeing the God of Israel in the form of the Shekinah glory. In his book, The Priestly Prayer of the Blessing, Warren shares how this dream was the catalyst that began his fascinating journey to find and truly know God in a supernatural, experiential, and intimate way! Ultimately, his book conveys how we can truly access our heavenly Father in a tangible, powerful way! This book unveils the deeper meaning of the prayer that the high priest Aaron would pronounce over the children of Israel every day while they wandered in the wilderness. Warren was given a revelation of the fullness of the meaning of this prayer as expressed in the Hebrew. His findings will fascinate you and profoundly affect you as you sense the heavenly Father's love for you and as you access the Father's divine embrace! Many books have been written on the "Father Heart" of God, but this book by Warren Marcus is not just knowing about our heavenly Father and His character, but instead it's about Warren's discovery on how to actually access our heavenly Father in a supernatural, experiential, and intimate way. I highly recommend reading this powerful and engaging book. I have personally been blessed by proclaiming this Priestly Prayer of the Blessing over myself, and family every day. We air the prayer every day as sung in Hebrew over our audience with the video piece produced by Warren Marcus. Many watching have ordered the course and the pendant. I pray the Priestly Prayer of the Blessing every day and the sweet blessings that God wants to bestow upon my life is experienced daily. I speak the verses out of God's Holy Word and then speak the amplified Hebrew-to-English translation. My walk and faith in God has become stronger, my passion and desire for Him has become greater. I have seen God bless my life and my family's life. My dad was diagnosed with multiple myeloma (cancer of the bone). And praise be to our God Almighty and our soon and coming King, my dad was touched by the Master's Hand and is fully and completely healed. I was laid off from a great paying job and needed work, and God has blessed me with two different jobs. In praying this divine prayer over my life daily it has made me capable to stand firmly in boldness and proclaim "His sweet name," and have the courage to speak out and not be in fear of making a mistake or saying the wrong thing. I have always been a shy person, but God has enabled me to be bold! Your heart will be stirred and your faith inspired, just as mine was, when you read the unfolding of the precious revelation that G-D has given Warren. It was my joy to be there when Warren Marcus first met His Messiah in October 1974. Hallelujah. The revelation of the Priestly Prayer of the Blessing that the God of Israel has imparted to Warren Marcus has made a profound impact on my life. I believe this revelation is a prophetic release of the power of embracing the fullness of Elohim and the understanding that the one true God is the God of Israel. Those who worship Him and receive the blessing bear His name. This name is obvious to the entire spirit realm and is the anointing of walking in His favor and His authority. Not only is "Abba, Father God," more fully understood, the glory of Yeshua, our great High Priest, is also revealed because He has made those who believe in Him priests forever after the order of Melchizedek. This gives us the blessing of receiving this prayer from Him and also the authority to pray it ourselves over others as His priesthood. As we fully receive, embrace, and then impart this divine prayer in the amplified Hebrew-to-English translation, we proclaim the glory of Elohim (one true G-D of Israel). There were people who were coming against our reputation and spreading false things about us, but after proclaiming the Priestly Prayer this stopped. We were also facing sleepless nights, but now we are able to get good night's sleep every night! And last of all, we were struggling with our finances, but after proclaiming the divine prayer every day, we now have to turn bookings away because we can't keep up with all of them. Faced with losing my home, I began proclaiming the Priestly Prayer of the Blessing every day. I was given $20,000 from a woman in my church, which was the exact amount needed to rescue my home. In addition, a friend unexpectedly bought me all new tires for my car including road hazard coverage, which I desperately needed. I just wanted to take a moment and let everyone know that I feel so blessed to have been able to have Warren Marcus bless "Paris Presbyterian Church" with his amazing teaching and anointed ministry. So many times when I feel lost or under attack I listen to the teaching by Warren Marcus on this prayer and it brings peace to my soul. I pray the amplified version of the Priestly Prayer of the Blessing every day. Thank you, Warren, for explaining the meaning in such great detail. I thank God for Warren explaining the meaning in such great detail. "Warren has been given new insight on how to enter into a supernatural, experiential and intimate relationship with the Heavenly Father... I highly suggest you read this powerful book." Years ago in the mid '60s, when I was a newly re-committed on fire Christian, I liked to listen to a dear Jewish radio evangelist named Dr. Arthur Michelson, who was faithfully preaching the gospel of Jesus Christ. He would always end his broadcast with Num. 6:24-26 "The LORD bless you and keep you; the LORD make his face shine upon you, and be gracious to you; the LORD lift up his countenance upon you and give you peace." And then he would add "in Jesus' name, amen!" I always appreciated the special blessing as his program ended. Warren Marcus tells of how in a recent archaeological dig in the old city of David, in Jerusalem, a small silver scroll was found with this very prayer inscribed in Paleo Hebrew. It was from the tomb of an ancient high priest of Israel. The prayer was powerful then, and it is powerful still today. The Scripture, Num. 6:27 goes on to say that when you put the LORD's name on his people, He will bless them! Warren, in his new book "The Ancient Priestly Prayer of The Blessing," tells tells how you can experience the power of this prayer over your life and family. May you be abundantly blessed as you read about it and receive your supernatural blessing that the your Heavenly Father intends for you to receive. "Warren...has been given new insight on how to enter into a supernatural, experiential and intimate relationship with the heavenly Father... I highly suggest you read this powerful book."